This dish is really delicious and I just don't have a photo of it that does it justice. 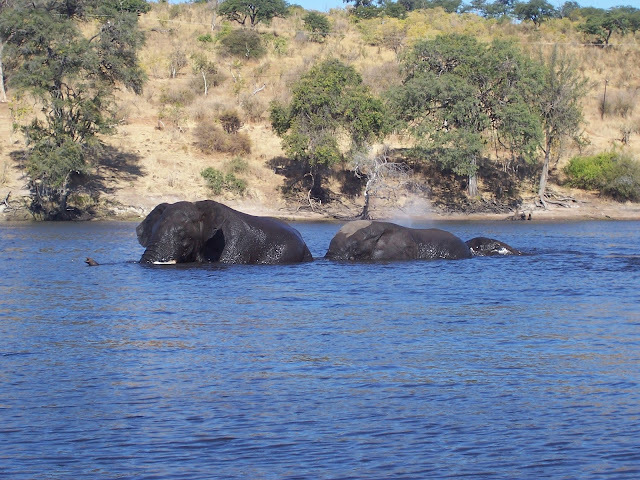 So you will have to use your imagination, and in return, I have provided you with a picture of some elephants wading through the Chobe river in Botswana. The flavours in this dish are unbeatable. I think it's the mixture of the fresh herbs and red wine which give it a thick, full-bodied feeling. Soak the ceps in the 150ml boiling water for 20 minutes and then drain and slice but reserve the liquid. Heat some olive oil in a frying pan and fry the chopped garlic cloves and the shallots. If they are small enough, it is nice to leave them whole, if they are a bit on the large side, chop them in half. Add the mixed mushrooms and chopped fresh herbs and fry for a further 5-10 minutes until golden. Remove from the pan with a slotted spoon and put to one side. Heat some more olive oil, preferably in a heavy dish such as a Le Creuset (or a deep saucepan if you don't have one) and fry the carrots, celery and pepper for 10 minutes. Add the red wine and boil rapidly for 3 minutes. Stir in the tinned haricot beans, in their liquid, the mushroom mixture, the ceps and their liquid, tomato puree and soy sauce. Season with the salt and pepper to taste. Slice the ready to bake baguette up and layer it over the top of the bean stew, starting from one side of the dish and slightly overlapping the slices in rows across to the other side. Mix together a few spoonfuls of olive oil, the chopped fresh thyme and chopped garlic. Brush this mixture evenly over the top of the breaded crust. Sprinkle some vegan parmesan over the top if you have some. Cover the dish with foil and pop in the oven at 190⁰C for half an hour. After this time, remove the foil carefully and put back in the oven to bake for another 20 minutes, during which time the crust should crisp up and turn golden brown. This recipe comes to you courtesy of a cookbook titled, 'Vegetarian,' by Louise Pickford and published in 2004 by Hamlyn.